I finished with classes last week and now all I have left to do is finals. I have three in total: torts, federal civil procedure and contracts. They're all worth 100% of the grade, so it's more than a little nerve wracking. Although most students would be happy to end classes, I was actually a little sad (and not just because it meant I would be studying for finals). I actually reallly loved all of my professors this semester and I don't like the thought of having new ones next semester. I have attachment issues clearly ... but it's all good. In under three weeks I will have completed 1/6 of this law school journey. My life hasn't been all studying and no play though. If you follow me on Instagram, then you already know that I've had the opportunity to attend several mixers and events this semester. I've been networking a lot and spending time with some really great and inspirational people. I also recently joined the Women's Lawyers Association of Los Angeles, which is pretty exciting. ALSO, most importantly, my neighbor (she's a 2L and soooo soooo sweet) told me about this beach that is right by our place that I never knew about it. We live off PCH which is the coast, but there isn't always coastal access along the highway because there are houses and business etc. Well, literally just two minutes away is a coastal access point and it's so serene and perfect. It's not ridiculously crowded and it made for the perfect studying nook. I put up my beach umbrella shortly after I took this photo and stayed there to go over Civ Pro for a few hours. It was honestly the best thing. Who knew studying could be so relaxing and gorgeous. Also, I've included a lovely creeper shot of a local doing yoga on the beach. 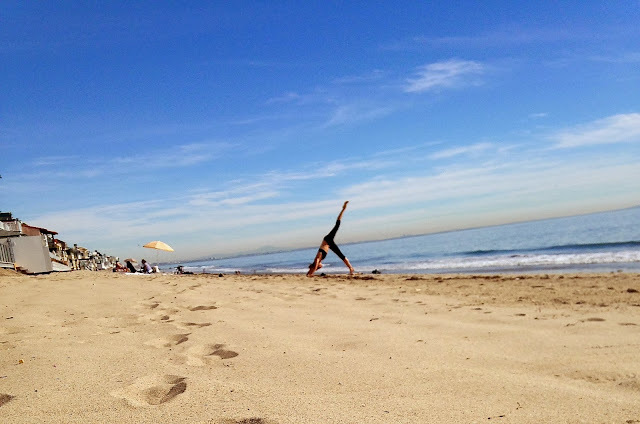 It's not that uncommon to see people working out on the beach in Malibu. I have to admit, I haven't been doing as much to take care of my body as I should be. I mean, I still "look" fit .. but apart from the occasional run, I really don't do anything physical anymore. I want to start working out in the mornings next semester. I'm always up around 6:30 whether I have a class or not, so I think it's doable. I'm just not sure what I want that workout to be. I've been wanting to try out yoga for a while now, but since I'm an amateur, I'm not sure if that can even be done on your own and I don't want an instructor. I'll have some time to figure all of that out over the break (in between re runs of all the trashy reality television I've been missing out on). If any of you have suggestions for me though on yoga and workouts for me next semester, I'm totally open to that. In the mean time, I hope everyone is enjoying their day and having a lot of fun getting ready for the upcoming holiday season:) I'm looking forward to being on break from law school and having the time to put together some real updated blog posts for you guys! that beach is beautiful - such a great find! you're a smarty pants, though...you'll be fine! Let's switch apartments! I'd die for a beach that nearby! thanks so much ! and yes, finals first. workouts later. That's a PERFECT spot for studying and to just.. be. I've been trying to find the energy and the drive to push myself to go to the gym, but with so much that I have going on, time and energy are just not on my side. Well, maybe time is, but energy.. not so much. As far as school goes, I can't wait to go back. I'm ready to get this degree out of the way and take a break from school. I have been going nonstop for 8 years. After this master's, I'm taking at least a 1-1/2 off before I work on another degree. I've always wanted to try yoga and the gym offers class for beginners, but it's never offered at a time that I can attend or that I even want to attend. I think I may try yoga on my children's wii. LOL! If you do get around to trying it, let me know how it is.